Sorrento is a town that features beautiful architecture and beautiful landscape. Another great thing about Sorrento is one can use it as a base to visit the other surrounding attractions. As it is on the Circumvesuviana rail system it is easily reached from Naples and an ideal base for visiting Pompeii and Herculaneum. Ferries regularly commute between Sorrento for Capri, making Sorrento an ideal base for exploring that island as well. So the next day, we took the rail to see the famous Pompeii, not to be mistaken for the modern Italian of Pompei. Pompeii, UNESCO World Heritage Site, was destroyed and buried under ash and pumice in the eruption of Mount Vesuvius in AD 79. 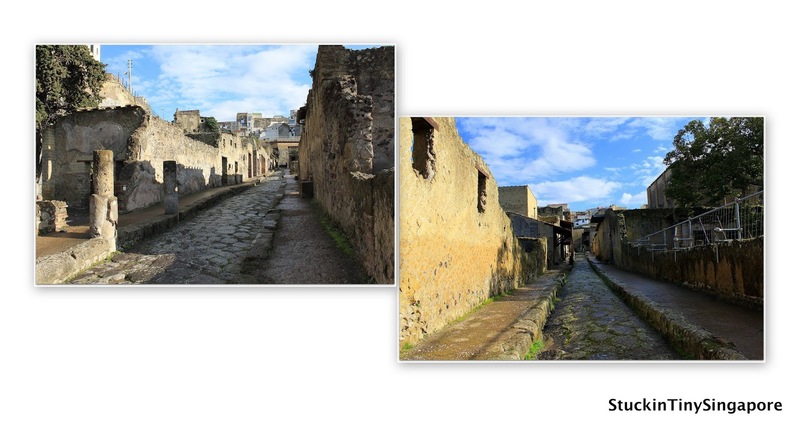 Pompeii remained preserved and undiscovered till 1749 after being lost for nearly 1700 years. Since then, Pompeii, one of the most popular tourist attractions in Italy, has fascinated 2.5 million visitors every year. This time capsule provides amazing details and insight into life in the city back in AD 79, is a must visit if you are in the area. Another less well known UNESCO World Hertage Site along the same train line is Herculaneum. Herculaneum was destroyed by the same eruption that destroyed Pompei. 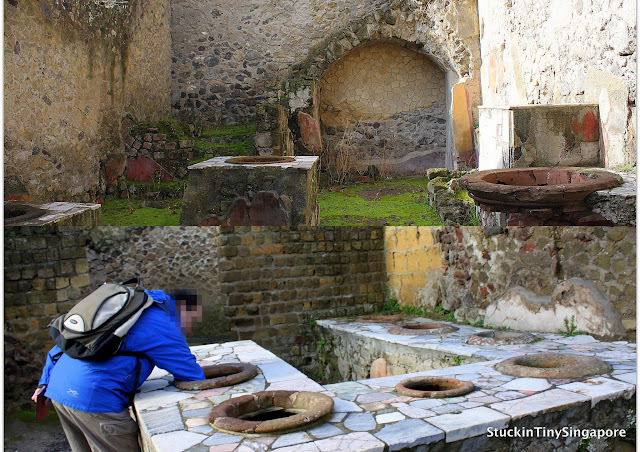 Much is buried under the modern town of Ercolano. Most people will only visit Pompeii and miss this place out totally. Being in close proximity, one should really visit Herculaneum as well. You take the Circumvesuvian railway and alight at the Ercolano Scavi station, and the Herculaneum is a short walk from the train station. The unfortunate thing is that Ercolano the town that is built on top of Herculaneum is rather ugly. It is preventing further excavation of the site, plus the modern town is causing a lot of damage to the archaelogical site in terms of water damage, and also local vandals who are contributing to the deterioration of the site, which is extremely sad and wasteful after 1600 years of remarkable preservation. The short walk from the train station to the site (about 6 blocks down the main street) is uncomfortable as you negotiate gangs of kids and rather unfriendly elements. But please don't let that deter you from otherwise a wonderful visit. 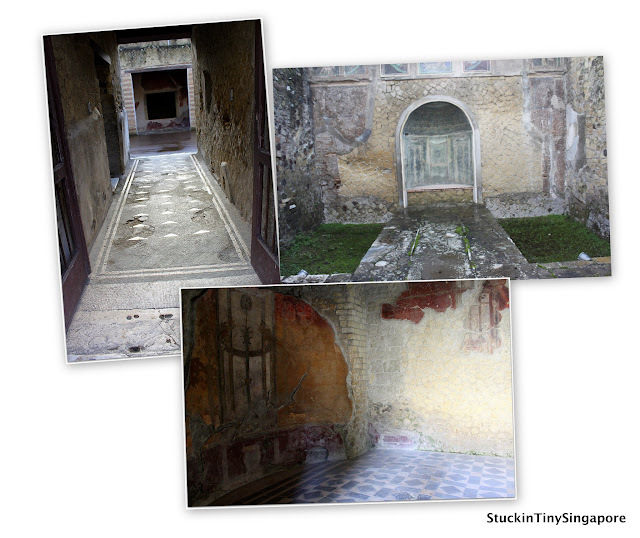 Herculaneum is of a smaller scale compared to Pompeii but is more interesting to visit. The geographical setting of Herculaneum allows one to see the magnitude of how much the volcanic eruption destroyed. Most of the buildings at Herculaneum was only covered by a few centimeters of ash before being solidified in succession of boiling mud which caused relatively little damage, preserving the whole site even the timbers were preserved in very good condition. It is a pity that most tourist gives Herculaneum is miss and head for Pompeii as what Pompeii has in scale, Herculaneum offers in height. Since it is more compact, it makes it easier to explore on foot, as Pompeii is so vast that it is very tiring to explore the entire sight in depth. A further advantage is there are far fewer visitors to Herculaneum than Pompeii that you don't have to fight your way past hordes of tourists and explore the site in leisure and relative peace. Walking around the Herculaneum, you can visualise how life was back in the AD 79. There were restaurants, baths and shops. The richer of the society had big houses with elaborate mosaics and paintings adorning their houses as compared to the poor. The ancient Romans were sophisticated and cultured. Herculaneum was a much small city compared to Pompeii, but with a wealthier population as evident looking around the site. The buildings here were more opulent, the frescoes and the intricate artwork of the tiles and the bathhouses, one for men, and one for women. It is just amazing how well preserved they are. Even the Thermopolium, which is the Roman day equivalent of our restaurants were well-preserved. You can see the stoves on well made marbled surfaces and the jars where food were stored. The same was observed at the Bottega where many pieces of works by a master artist were preserved. At the Casa di Nettuno e Anfitrite, the nymphaeum (monument to the nymphs) had opulent mosaics on the wall. The colours of the mosaics are still so vivid still. 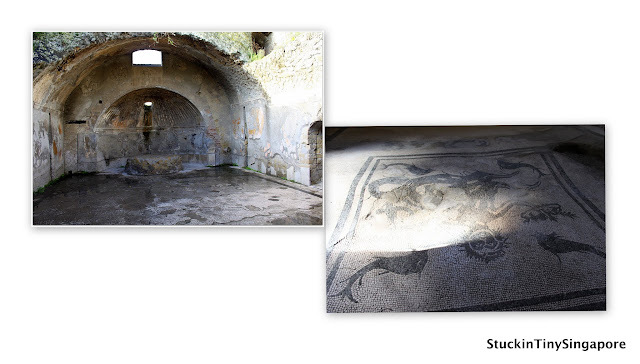 Casa Samnitica or the Samnite house is one of the oldest buildings discovered so far in Herculaneum. At the time of the eruption, it was already 300 years old! Due to the town being on the other side of Mount Vesuvius, the wind did not rain down heavy pumice and as a result the roofs of many houses remained intact and the frescoes remained preserved and vibrant. Due to the town's proximity to Naples or Napoli (in Italian), the city was more advanced. You can find apartment blocks, much fancier than anything you find in Pompeii. 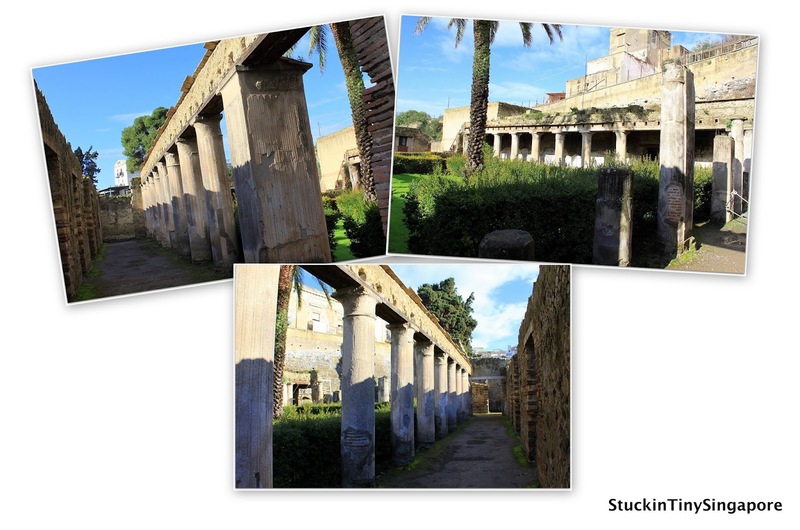 Stumbled across a great website and document panoramas all around the Herculaneum, check it out here. Interestingly, back in the Roman times, Herculaneum used to be right on the coast. There were chambers built for storing boats. After Mount Vesuvius erupted, many tried to escape to the coast via the boat but were overcame by the volcanic fumes. It was in the 1980s when they discovered over 300 skeletons down at where the boathouses used to be. Can see on the left that the site is 4 stories below the current city line, and the moat around on the is where the beach was. All in all, our visit to the Herculaneum was an eye-opener. We spent the first half of our day there and had to rush through as we were going to visit Pompeii after lunch. It was a great start to a packed day. Follow us in our next post for our visit to Pompeii. Ciao. great pics and even better descriptions!